This is a real winter-warmer! Comforting and rich, wholesome and utterly delicious. And the great thing is, you prepare it in the morning, then forget all about it until it’s time to eat…and in the meantime your home smells good enough to eat all day! 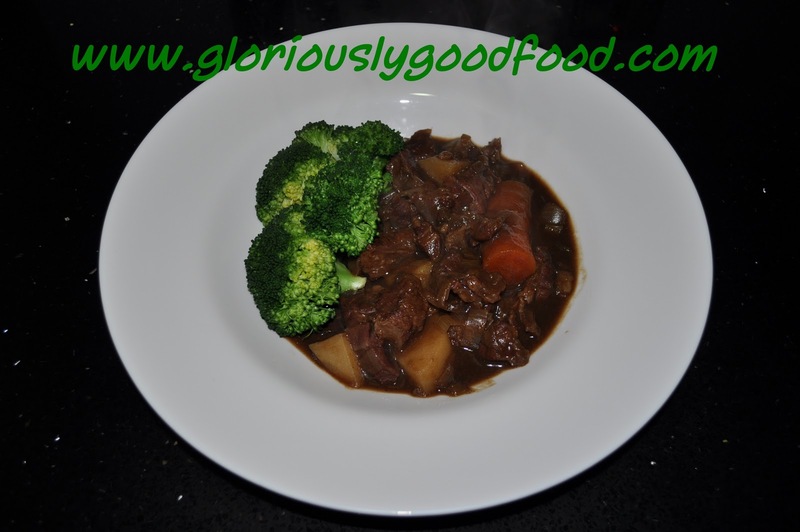 I particularly like cooking this stew when I know I’m going to be busy or out & about all day, so it’s perfect for those winter Sundays when we go for a long bracing walk in the fresh air in the morning, knowing that the stew is already simmering away in the slow-cooker and we’ll come home to the delicious smell and no cooking to do. Place the flour in a large bowl (the trick here is to have an over-sized bowl to allow for good mixing with the meat, so that you can coat the meat thinly and only use a little bit of flour), season with a little bit of salt. When cooked, take out some of the gravy, a few carrot & potato bits, some onion bits and all the celery, put in a blender and blitz until smooth (take care when blending hot liquids…leave the centre cover off the lid to allow steam to escape and cover it with a folded tea-towel when you turn the blender on), then return to the pot…this thickens the gravy to a perfect consistency without need for additional thickeners/flour. I know I use a lot of poultry and I do have recipes that don’t involve chicken, turkey or generally low-fat ingredients, but everybody’s more health conscious, I find I can’t lose weight unless I innovate with my food, and the end result is lots o low-fat poultry-based recipes! In a big stockpot or casserole dish, melt the butter, then add the chopped onion & garlic. Fry, stirring continuously, on a high heat for a minute or two. Once they start browning & softening, add the chicken. Season the chicken with a little salt and some ground chilli flakes (I go easy on the chilli at this stage so everyone can then add some chilli flakes according to their own taste at the table), stir and ensure the chicken is sealed/browned all over. Turn the heat down to minimum (if you’re using an electric hob, take the pan off the heat as the hob will be too slow to respond) and add the flour. Stir it in quickly, making sure it’s coated the chicken pieces and absorbed any juices, then gradually add a bit of stock, stir it in until the thick ‘sauce’ is smooth, then add a bit more and stir it in again, repeating this until you can add the entire stock. 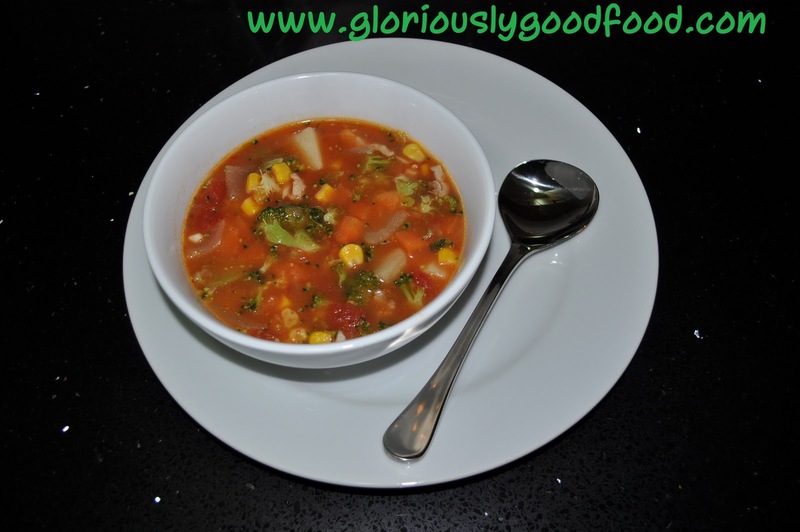 Add the chopped tomatoes, potatoes, sweetcorn and carrots to the pot, but not the broccoli. Bring to the boil, stirring occasionally, then put on a lid, turn the heat down to minimum and leave to simmer for approximately 20 minutes, stirring occasionally. The potatoes should be cooked but not too soft at this point. Add the broccoli, stir in and replace the lid. Leave to cook until you’re happy with the broccoli consistency (about 5 minutes max for me as I like my broccoli fairly crunchy). Came across this on Twitter today and just HAD to share. Beautiful!